We are celebrating Dr. Seuss this week, and reading a different Seuss book each day. 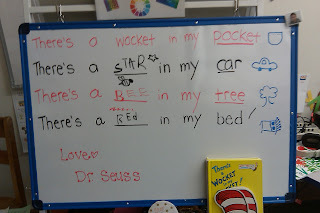 The kids have been thrilled to come in each morning to find that Dr. Seuss has snuck in at nighttime to write them a morning message. Of course, the kids were dying to know how the message got there. One theory is that he crawls out of his favorite books at time. Why? Because he's magic! Another theory is that our life sized Cat in the Hat poster on the door comes to life at night, just like the toys in Toy Story. 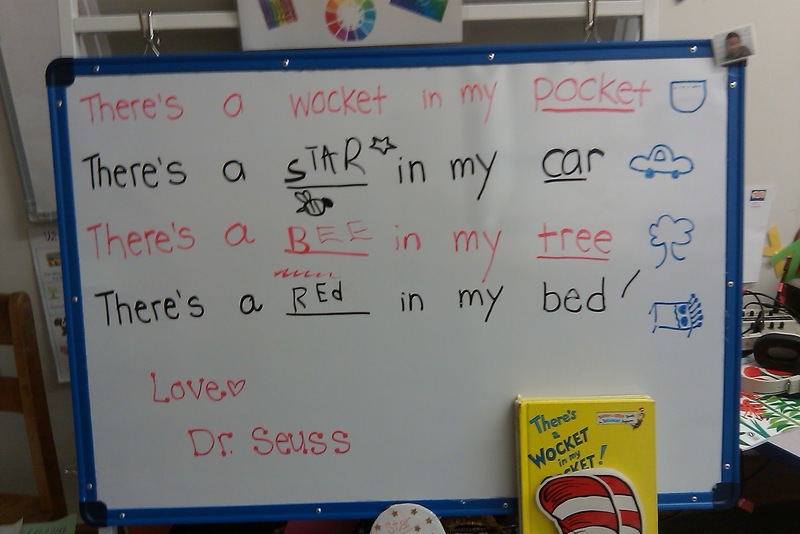 We read this message together several times, sounding out words that we did not know. 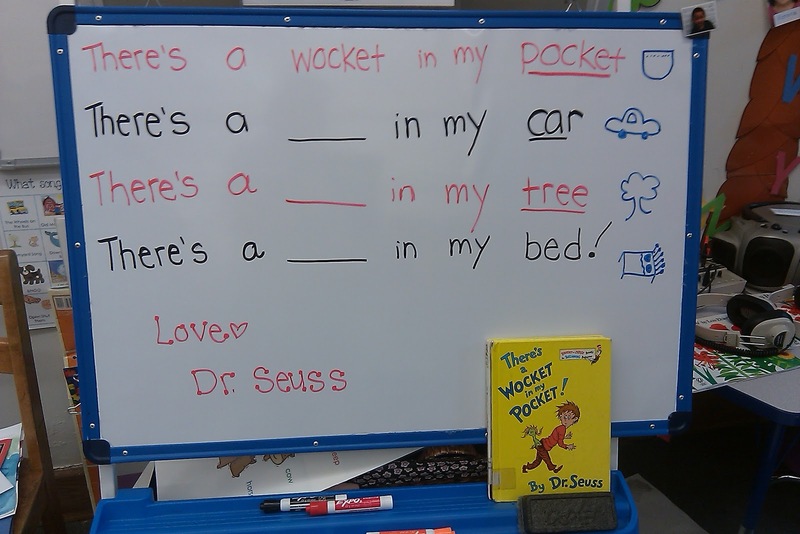 Afterwards, the children identified and circled the rhyming words. Then we made a list of all of the words in the "at" family. For this morning message, we read each sentence twice. 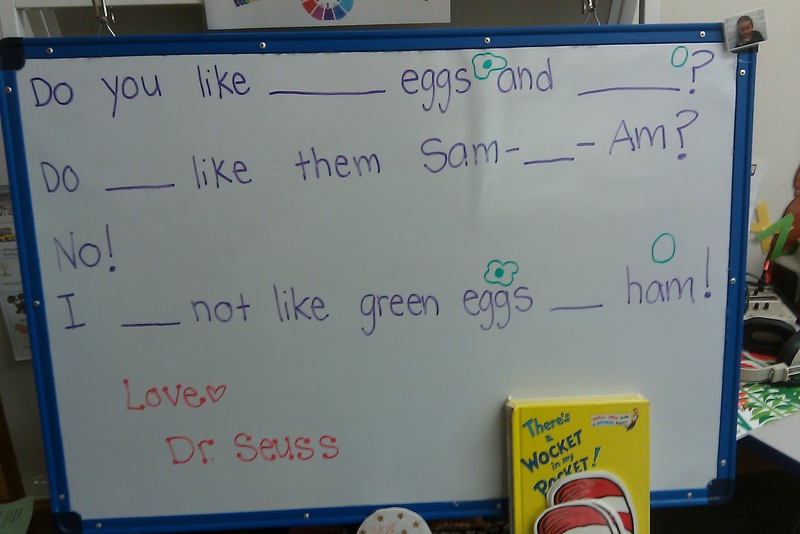 Then the kids thought of silly rhymes for each sentence. 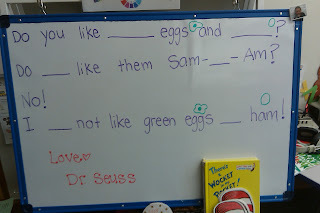 They wrote the words on the blank with the whole class helping to sound out each word. They thought it was super funny to write there is a star in my car, etc. We used this morning message to practice sight words, rhyming and to make connections to the text while building fluency. 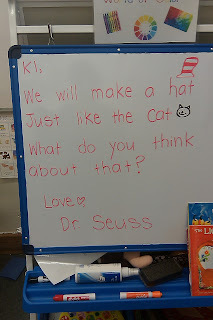 I think that interactive writing is one of the best things you can do with Kindergartners, so I love this activity and they did too. 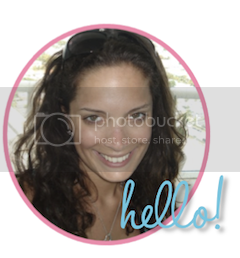 Next time I will have to remember to take an "after" picture!